The Koch brothers are involved directly or through their network with a number of politically active nonprofits that spend money on elections. Perhaps the most prominent is Americans for Prosperity, which David Koch founded in 2004. The organization spent $14 million on federal races during the 2016 election cycle, placing it fourth on the list of top dark money spenders. The Koch brothers also have deep ties to Freedom Partners Chamber of Commerce, a nonprofit business association that distributes funds to conservative groups in the Koch network. All but one of its directors is a current or former employee of Koch Industries. Politico described Freedom Partners as the “Koch brothers’ secret bank.” The group’s 2015 tax return, obtained by USA today, shows that it took in more than $139 million in revenue that year. In addition, the brothers have close connections with Donors Trust, a Virginia-based nonprofit that distributes funds to a network of think tanks and media organizations “that push free-market ideology,” according to The Center for Public Integrity. Charles Koch and his longtime political advisor, Richard Fink, run The Knowledge and Progress Fund, which, since 2004, has contributed almost exclusively to Donors Trust. Mother Jones described Donors Trust as the “dark-money ATM of the conservative movement.” The mostly conservative groups supported by the Koch network include: the 60 Plus Association, American Commitment, American Future Fund, American Legislative Exchange Council (ALEC), Americans for Job Security, Americans for Limited Government, Americans for Responsible Leadership, Center for Shared Services, CitizenLink, Concerned Women for America, Generation Opportunity, Public Notice, and The Libre Initiative Trust. 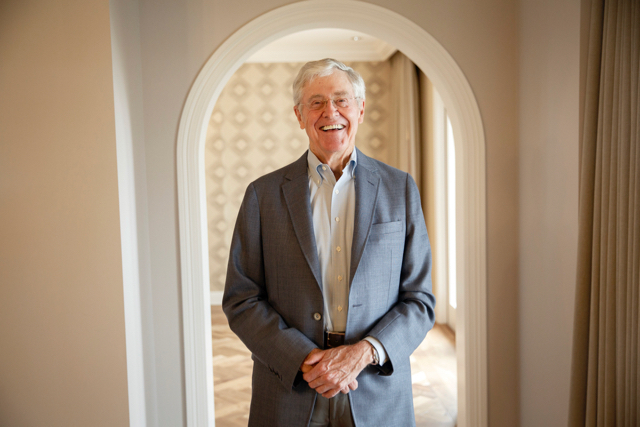 The Koch network uses its vast resources to influence federal, state, and local elections. During the 2016 election cycle, the network focused its efforts on helping the Republican party maintain its majority in both the U.S. House and Senate. Seven of the eight Democratic Senate candidates that Americans for Prosperity targeted for defeat lost in the general election. Although Charles Koch said he would not provide financial support to Donald Trump’s presidential campaign, members of the Koch network have key roles on Trump’s transition team. For example, Myron Ebell, a climate change skeptic who is leading the transition at the Environmental Protection Agency, has worked for an organization funded by Donors Trust. (Researchers have determined that the Koch network has helped fund groups that question the science behind climate change.) The Koch network has also provided support for the Tea Party movement, according to the nonpartisan Factcheck.org, and the Freedom Caucus, which includes some of the most conservative members of Congress. An analysis by Politico and the Center for Responsive Politics found that Koch Industries helped “nurture the political careers of the [Caucus’s] 37 known members.” Americans for Prosperity has been at the forefront of the network’s involvement in state and local elections, advocating for fewer taxes and less government spending. In 2015, the group created the Grassroots Leadership Academy. Since then, more than 10,000 people have attended an academy program, where they hear presentations on everything from political organizing to the “moral case for fossil fuels,” according to the New York Times.